Estuaries are characterized by tidally-influenced waters that have a surface connection to the sea. The connection may be permanently open, restricted, or intermittently closed. Oregon’s estuaries are part of the Coast Range ecoregion and are a critical interface between the terrestrial environment of coastal watersheds and the nearshore marine environment. Estuaries are designated as a Strategy Habitat in the Oregon Conservation Strategy and the riverine portions are discussed there. The Nearshore Strategy focuses on species and habitats where saline marine waters influence the ecological communities. The estuarine system extends from the mouth of the estuary, defined by an imaginary line connecting the two most seaward portions of land, upstream to the head of tide where the average difference in water level caused by tides is 0.2 feet (0.06 m). Estuarine tidal basins are generally narrow and elongated throughout their upper riverine regions, and may be broad and shallow in the middle and lower regions before making the connection to the sea. These basins are typically drained and filled by a primary tidal channel that is connected to numerous secondary and tertiary channels, inlets, sloughs, and tidal creeks. 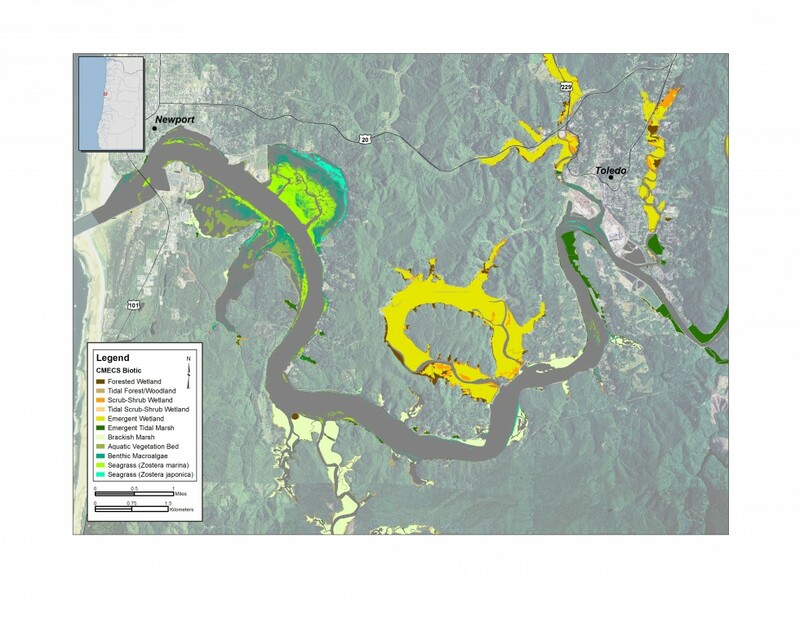 Within the CMECS framework, the Oregon estuarine aquatic system is defined by geomorphology of the tidal basins and by the salinity regime of the brackish waters. The estuarine system is composed of several subsystems, including: (1) tidal riverine coastal; (2) tidal riverine coastal –diked (3) tidal riverine open water; (4) coastal; (5) coastal – diked; and (6) open water. Although the riverine subsystems greatly influence the lower portions of the estuaries, the species and habitats in the nearshore ecoregion all occur in the coastal and open water subsystems where the average salinity during the summer dry season / low freshwater flow period is greater than 0.5 practical salinity units. Oregon’s estuaries exhibit a wide variety of CMECS geoform components such as bays, beaches, berms, boulder fields, channels, coves, deltas, islands, lagoons, levees, marsh platforms, mega-ripples, rubble fields, shoals, shoreline, sloughs, spits, stacks, tidal creeks, tidal flats, and tidepools. The estuaries also contain a diverse variety of geoforms with biogenic origin such as burrows, bioturbation areas, and shell beds. Anthropogenic origin geoforms are widely represented in the Oregon estuaries and include aquaculture structures, boat launches, breakwaters and jetties, bridges, bulkheads and seawalls, dikes and levees, docks and piers, dredged channels, dredge deposit and fill areas, harbors and marinas, intakes and outfalls, pilings, rip-rap, and wharves. Mapping efforts of Oregon’s estuaries utilizing CMECS components is underway and an online tool for viewing estuary maps is available at: http://www.coastalatlas.net/estuarymaps/. This is a work in progress and data for various CMECS components is not yet complete. It is designed to help with planning efforts and is administered by the Oregon Coastal Management Program. An example of a geoform components map of Yaquina Bay shows a number of its geoforms for which data are available (Figure 6.9). Figure 6.9. Map of Yaquina Bay depicting CMECS Geoform Components of geologic and anthropogenic origin. Oregon’s estuaries are dynamic and productive components of the nearshore coastal ecosystem. They harbor a rich diversity of species, habitats and ecological communities. This highly complex, productive habitat is critical for many fish and wild­life species, including salmon, crabs and other shellfish, juvenile marine fish, marine mam­mals and birds. Primary production in estuary habitats is among the highest of any on earth, meaning that both the visible and microscopic plants produce a tremendous amount of carbon material (from photosynthesis) that supports the base of the food web. Tidal marshes are particularly productive and produce plant material that, when it dies seasonally, is broken down by microscopic bacteria to serve as food for many organisms which in turn are eaten by larger ones as material is distributed throughout the estuary with the tides. Estuaries and eelgrass beds are habitat types that have been designated as a Habitat Area of Particular Concern under NOAA Fisheries’ Essential Fish Habitat regulations for salmon and groundfish species. Efforts to maintain and restore estuaries will benefit many wildlife and commercially important species. Many Strategy, Watch List, and other commonly associated species utilize Oregon’s estuaries during parts of their life history (Table 6.3, Appendix E and F). For some, such the blue mud shrimp and Olympia oyster, the adult and reproductive stage is entirely in estuaries. Longfin smelt also spawn in estuaries. Native eelgrass is an important habitat forming species in estuaries. Native eelgrass and the habitat it provides is utilized by several Nearshore Strategy Species, for example: Black brant, Dungeness crab, black rockfish, copper rockfish and kelp greenling. Eelgrass is also an important spawning substrate for Pacific herring, an important forage fish species. Complex ecological communities occur in the different regions of Oregon bays and estuaries. Many invertebrates such as gaper clams, butter clams, native littleneck clams, softshell clams, and cockles live in the soft sediments along with polychaete worms, amphipods and burrowing shrimp. Other species, like barnacles, mussels, oysters, tunicates, and hydroids live attached to hard surfaces. More mobile species such as fishes, sea stars, birds and marine mammals utilize a wider variety of habitats. Starry flounder, English sole, sand sole, staghorn sculpins, and sturgeon are benthic feeders that utilize subtidal habitat to locate their prey. Salmonid species that utilize and move through estuaries include Chinook, coho, and chum salmon, steelhead and coastal cutthroat trout. Pelagic fishes like eulachon, topsmelt, Pacific herring, longfin smelt, surf smelt, northern anchovy, and Pacific sand lance also utilize Oregon estuaries. Estuaries provide important wintering habitat for waterfowl and migration feeding area stopovers for or a wide variety of shorebirds. The tidal channels, sand flats, and mudflats are also used regularly by raccoons and river otters. The CMECS biotic components are determined by the dominant biota, defined as those with the greatest percent coverage. Although planktonic maps and maps of fauna associated with bottom substrate are possible, most mapping work in Oregon estuaries has focused on vegetation cover. An example of a biotic component map for Yaquina Bay (Figure 6.10) shows available CMECS biotic information along with more specific work that focused on eelgrasses. 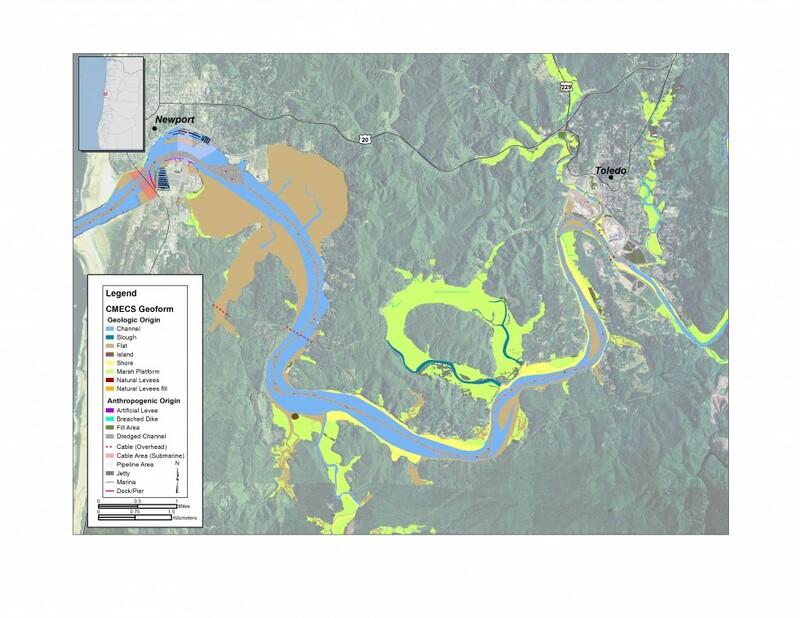 Gathering data to improve mapping the biotic components of Oregon’s estuaries is a work in progress that is anticipated to be valuable for planning, management, research and monitoring purposes. Figure 6.10. Map of Yaquina Bay with CMECS Biotic Components. Photo Credit: Gregory Krutzikowsky. Many estuaries have human communities on their shorelines and serve as ports and venues for recreational boating. Oregon has 22 major estuaries (Figure 6.11) and many other smaller estuaries along its coast. Many coastal cities developed around estuaries. People use estuaries for recreational and commercial harvest of fish and shellfish, navigation and shipping, ports for recreational and commercial vessels, shellfish aquaculture, hunting, sightseeing, bird watching, sailing, and other recreational and commercial activities. Portions of most of the larger estuaries have been altered through dredging, filling or diking. Many of the smaller estuaries remain in a more natural state. Twenty-two cities, seven counties, and thirteen port districts have planning or management responsibilities for Oregon’s major estuaries and work with the Oregon Coastal Management Program and other state and federal agencies. Oregon utilizes a four level estuary classification system that defines the level of development permitted: natural; conservation; shallow draft development; and deep draft development. Natural estuaries are usually little developed for residential, commercial or industrial uses and include Sand Lake, Salmon River, Elk River and Pistol River. These estuaries do not have maintained jetties or channels. Conservation estuaries are within or adjacent to urban areas which have altered shorelines. These include the Necanicum River, Netarts Bay, Nestucca River, Siletz Bay, Alsea Bay and Winchuck River. Like natural estuaries maintained jetties and channels are absent. Shallow draft estuaries include Nehalem Bay, Tillamook Bay, Depoe Bay, Siuslaw River, Umpqua River, Coquille River, Rouge River, and Chetco River. These estuaries have maintained jetties and a main channel maintained by dredging to 22 feet (6.7 m) or less. Oregon’s three deep draft estuaries, the Columbia River, Yaquina Bay and Coos Bay, are maintained by dredging to depths of 22 feet or deeper and have maintained jetties. This management classification system is designed to preserve the inherent diversity among Oregon’s estuaries, and to guide the process of residential and industrial development in estuaries that have been altered and which can support further urbanization. Figure 6.11. Oregon’s 22 major estuaries are classified into four levels for development and planning purposes.